We noticed that on our site there are a lot of male characters from comics, but few female ones. 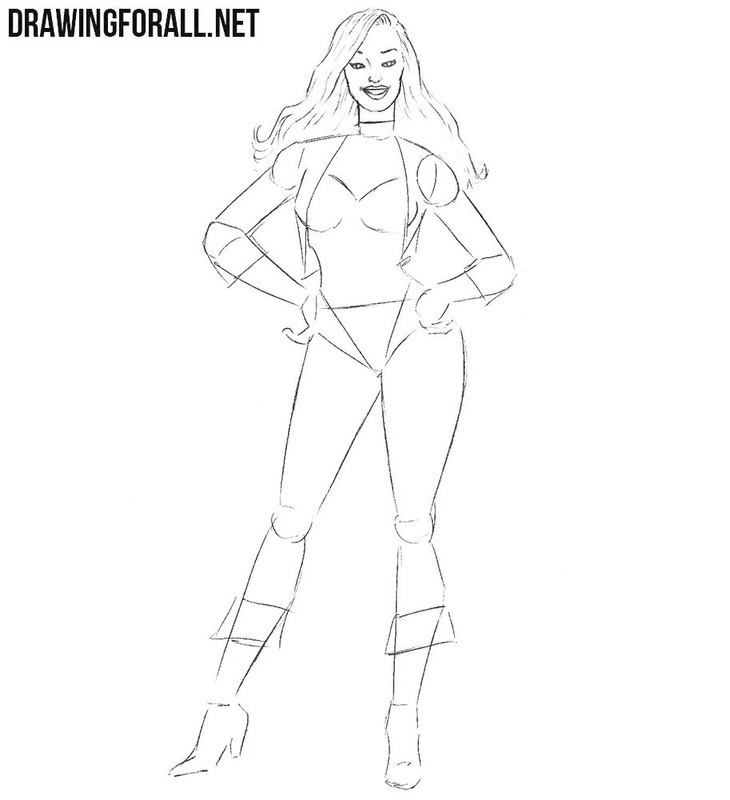 Today we decided to correct this situation, and want to show you how to draw Black Canary. In fact, this is the name of two fictional comic book characters from DC Comics. The drawing of any person begins with his skeleton, and this lesson is no exception. Let’s start with the head, sketching it in the form of a regular oval. With the help of a simple line we sketch out the spine. On this line of the spine we sketch out the chest and the pelvis. 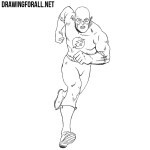 With the help of simple lines we outline arms and legs. Recall that all the lines of the first steps should be the very light. Let’s now outline a bit of volume to the body of Black Canary. We start with the face, drawing two intersecting lines on it. Next we sketch out the outlines of the neck, which smoothly flows into the torso. When drawing the torso we need to take into account all the curves of the body. After that, we outline the arms and legs with simple geometric shapes. 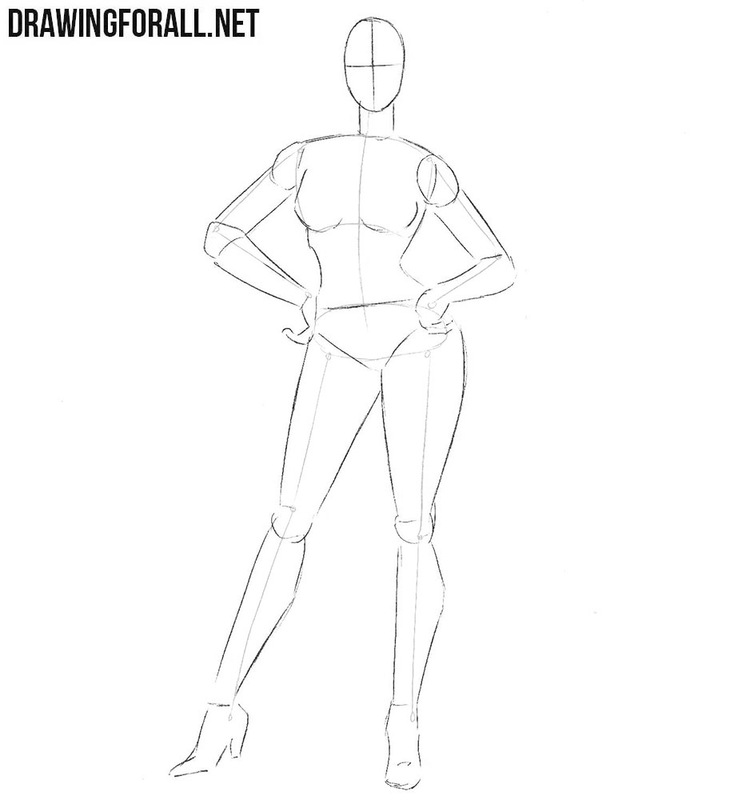 Note that the arms should be quite thin, and the hips are wide enough. Let’s continue the basis of our Black Canary drawing. In this step we will outline the most basic details. Let’s start with the head, sketching out the outlines of the face using the intersecting lines from the previous step. Next, sketch out the long hair as in our example. 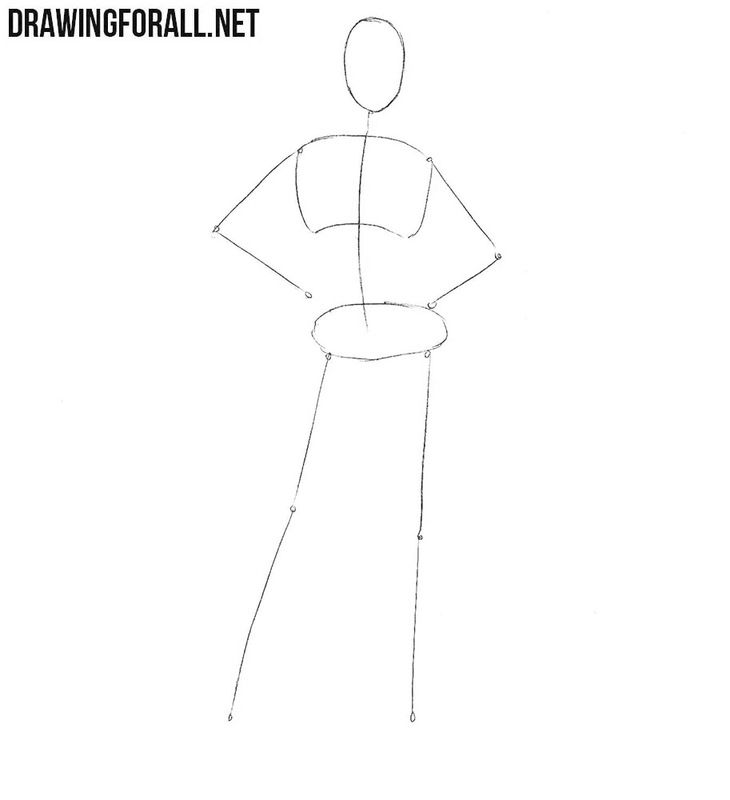 Move a little lower and sketch out the outlines of clothing, as shown in our example below. Starting from this step, dear artists, we will need to use darker lines. First, with the help of such lines, we need to carefully draw the outlines of the face. 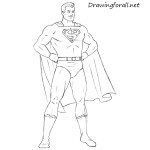 Further, we also accurately draw the outlines of the face and with the help of long and curved lines draw the hair. Remove all unnecessary guidelines from the head and move to the step number five. Here we need to draw the details of the torso, or rather the details of the clothes on the torso. With the help of smooth and very dark lines (you can use a darker pencil or a liner) gently draw out the jacket. After that draw the outlines of the torso, visible from under the jacket. Removing all unnecessary guidelines from the torso we move to the step numer six. In the step six, we need to draw out the arms. Note that women’s arms should be thinner than men’s (if you not draw She-Hulk). Most of the arms are closed by the sleeves of the jacket, so try to draw them most correctly, considering all the folds. 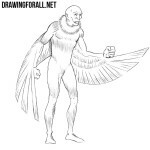 By the way, if you want to learn to draw hands, then visit the drawing tutorial about it. 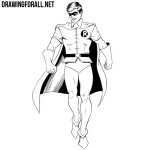 If you have coped with the process of drawing the arms, then it’s time to draw out the legs. With the help of long and very smooth lines gently draw the hips, which smoothly flow into the legs. Draw the boots as shown in our example. 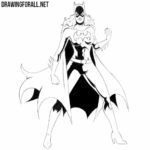 Erase all remaining unnecessary guidelines from the drawing and move on to the final step of the lesson on how to draw Black Canary. So, we are at the last step, which means that it is time to draw shadows. First, let’s determine the light source, and then with the help of hatching we will add shadows to the least illuminated areas of the drawing. If you want to make the shadows darker, add another layer of hatching. In the same step, draw the texture on the legs with intersecting lines. So, the lesson on how to draw a Black Canary came to an end, but you can attend other drawing lessons about comic book characters. We are looking forward to your wishes and suggestions about this and our other drawing lessons. And also we are waiting for you in our social networks, where there is always the latest news and announcements of new drawing lessons.